Recently Gary sent us a message on out Spy on our Spy Phones Today! It's kind of complicated but oh well. "Great Scott - of course! 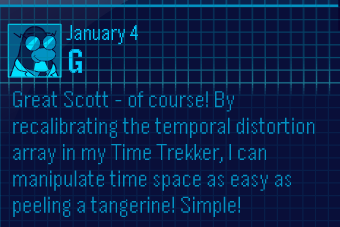 By recalibrating the temporal distortions array in my Time Trekker, I can manipulate time space as easy as peeling a tangerine! Simple!" He's rambling on about how simple his Time Trekker was after all. I hope he sends more understandable messages in the future. Why do you think he sent us this really complicating message? Leave a comment and let me know!